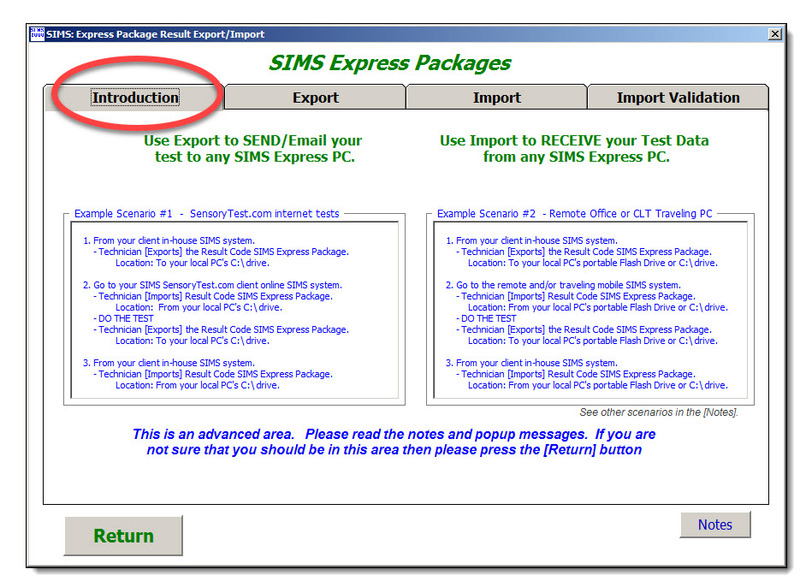 SIMS Express Packages, print screens from SIMS. Test anywhere, anytime, and on any PC. SIMS Express Packages can be used to copy and transfer entire tests to & from SensoryTest.com and your in-house corporate systems. Example scenario - SensoryTest.com internet tests. SIMS Express Packages can be used to copy and transfer entire tests to & from traveling PCs and your in-house corporate systems. 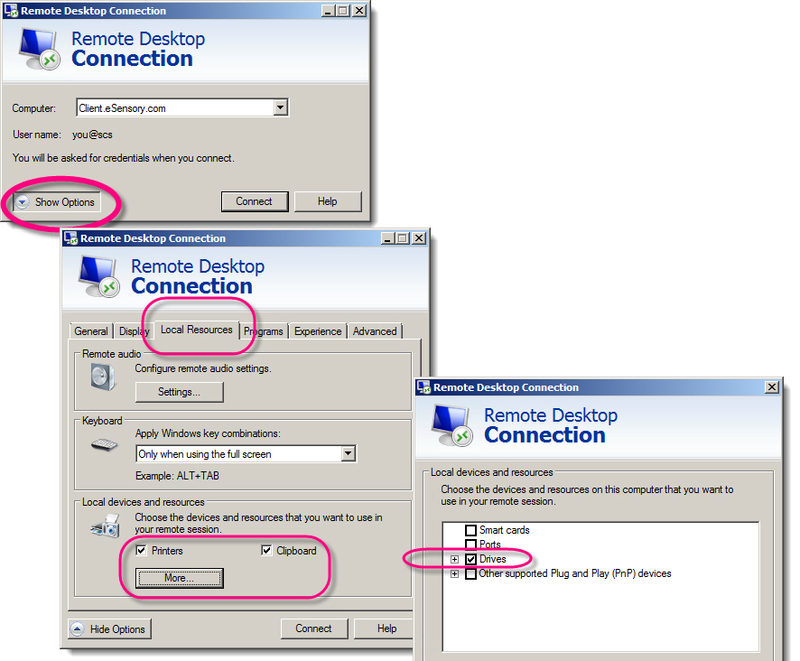 Example scenario - Traveling PC, Remote Office, or CLT, one or more PCs, no internet access. Answer: When you connect to SIMS Online you need to share "Local Resources" "Drives"
Use Export to SEND/Email your SIMS test to any SIMS Express PC. The Export file package is a complete SIMS Test Result Code, all of the test components and test panelist data. sample rotation plans, questionnaires, experimental designs, experimental plans, etc. - The test data in the package includes the entire result data set, every panelist response up-to-the-minute. 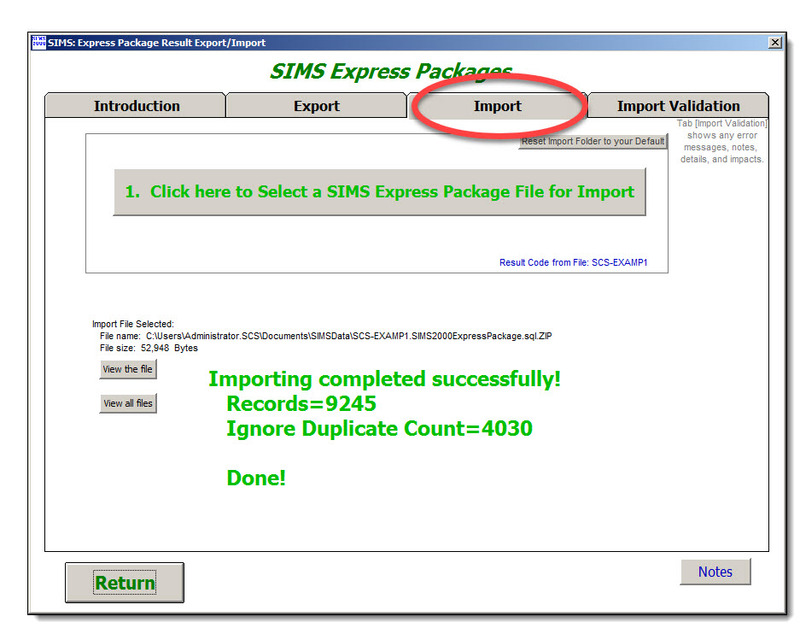 Use Import to RECEIVE your Test Data from any SIMS Express PC. 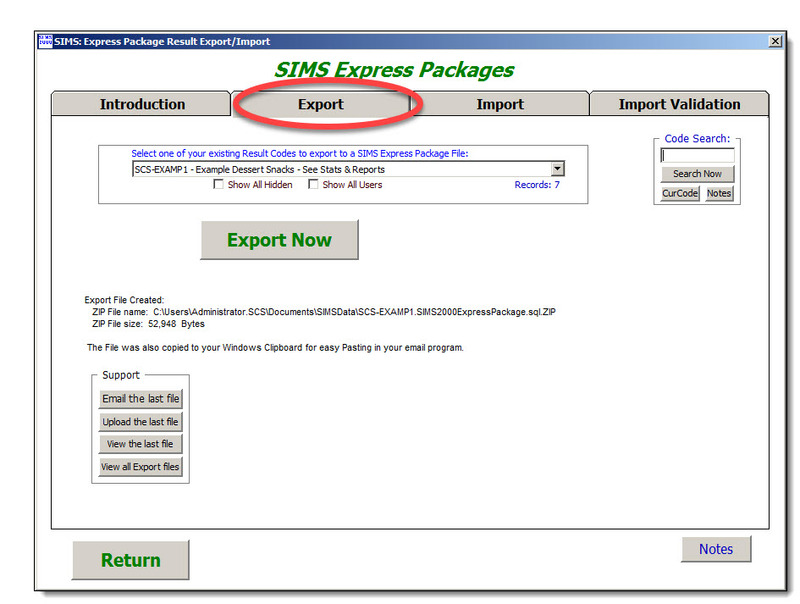 1) Select the file for import, the SIMS express package. view any error messages, notes, details, and impacts. 2) Import Now. This will only be enabled if the verifications passed for the file selected above. Import Note: SIMS needs to be installed on the remote PC for Import. 1. From your client in-house SIMS system. - Technician Exports the Result Code SIMS Express Package. 2. Go to your SIMS SensoryTest.com private client online SIMS system. - Technician Imports Result Code SIMS Express Package. 3. From your client in-house SIMS system. 2. Go to the remote and/or traveling mobile SIMS system. exchange SIMS Express Packages and SIMS not needed on remote PCs. Sample Set data redundancy and duplication avoidance. Import will not overwrite any existing data which occupies the exact same sample set. which should insure unique sample set assignment and allow for successful imports. to import another file, or even the same file, with same use 1-50 sample sets. SIMS is not able to overwrite the initially imported 1-50 sample sets. During Import Now, a count of ignored data records, if any, will be clearly shown on the screen. Import File verifications on the 4th tab show detailed information about the Import file selected. 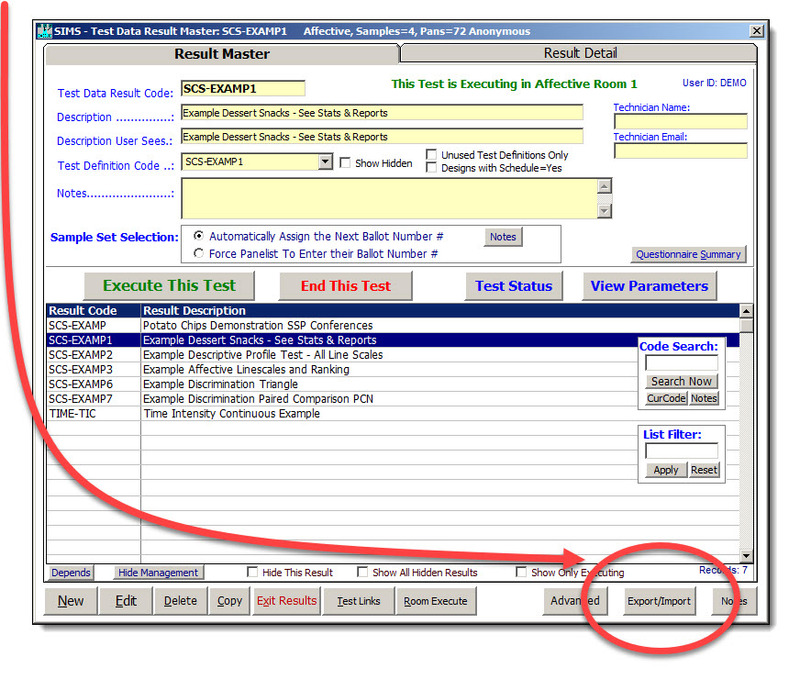 Details shown include File vs Database information, matching information with pre-exiting data notes. details the information from the source SIMS system where the import file was created. that they properly match the details the source SIMS system where the import file was created. traveling, mobile and/or portable PC comptuer system, or as networked PC on a local area Network. A traveling system will also need it's own SQL database such as the free SQL Express on our DVDs. Future enhancement plans for remote one-seat testing stations. one-seat testing stations for virtually anywhere & anytime. Simple copy/email the tests around as needed. and trained and/or trusted panelists, but not quite for home use consumers. This is an advanced area. Please read the notes and popup messages. If you are not sure that you should be in this area then please proceed with caution. All data activity in this area is validated, audited and tracked. An alternative to SIMS Express Packages you can also just Copy a ballot. Data hosting options are of your choosing. Hosting by you on your onsite company SQL data host and/or by our internet cloud based Software as a Service (SaaS). And whatever balance and combination of the two you need. If you need 100% onsite data host, or 100% Software as a Service (SaaS), or any combination of the two, it is your choice. Whatever you need. We deliver both solutions because clients frequently need both. For your everyday onsite tests you can choose to keep all of your valuable data 100% within your network (via free Microsoft SQL Express database for your data host which we can provide) where no internet is needed at all. Many clients do not want any of their data unnecessarily in the internet cloud unless absolutely necessary, and we totally agree. For those times when you want to run an internet based test, such as Home Use Test's (HUTs) and Central Location Tests (CLTs) we provide www.SensoryTest.com Software as a Service (SaaS). Same low SIMS Software price includes both platforms. SIMS Software offers Two flexible platform solutions for your data. SIMS Cloud & SIMS Onsite. You can select either one or any combination of the two. One low price for both solutions. Chrome, Safari, Firefox, Microsoft Edge, MS Internet Explorer, etc.